Senior Constable Clarrie Pirie was the Officer-in-Charge of the Capertee Police Station from 1958 until his death on 13 October, 1960. On that day he was informed by Lithgow Police that two male offenders had abandoned a stolen car at Cudgigong, north of Capertee. While patrolling the area Senior Constable Pirie found two fourteen year-olds with a vehicle at a roadside camping area at Jews Creek, ten miles south of Capertee. These however were not the two offenders the police were searching for and as such Constable Pirie did not know that on the previous day the pair had escaped from the Yasmar children’s detention centre ( Lidcombe ) and had broken into a dwelling where they stole several items of property and the vehicle before driving to the Jews Creek area. As the constable was talking to the young offenders one of them suddenly produced a .22 rifle and shot Constable Pirie. He died a short time later. Both youths were captured the following day. The senior constable was born in 1920 and joined the New South Wales Police Force on 15 September, 1947. At the time of his death he was stationed at Capertee. As an aside – Clarence PIRIE was the cousin of Victor AHEARN who was also shot and murdered in 1946 aged 40. Almost all visitors to Capertee will notice the large memorial park in the middle of the village close to the Glen Davies turnoff. This recreational area, which includes a car park, childrens’ playground and toilets, is officially named after Clarence Pirie a notable policeman who was stationed in the community during the late 1950s and early 60s. 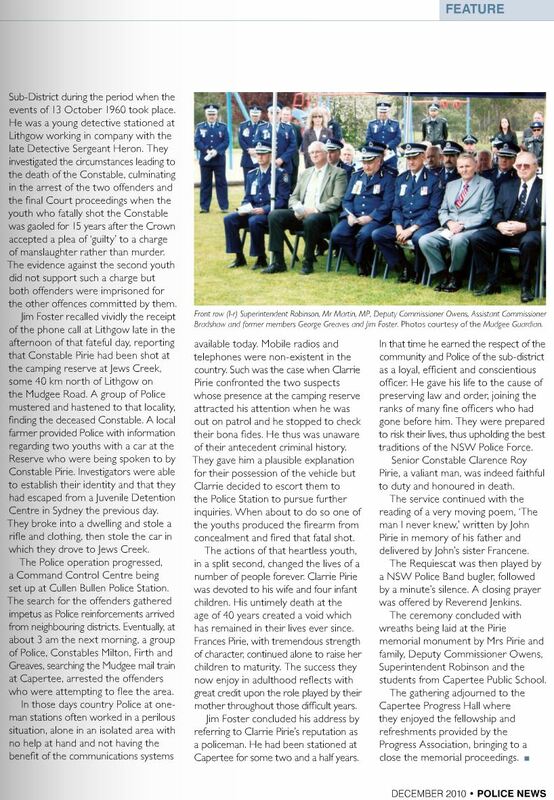 While many police have served the Capertee district well over the years Pirie deserves lasting recognition as he gave his life to protecting the community. 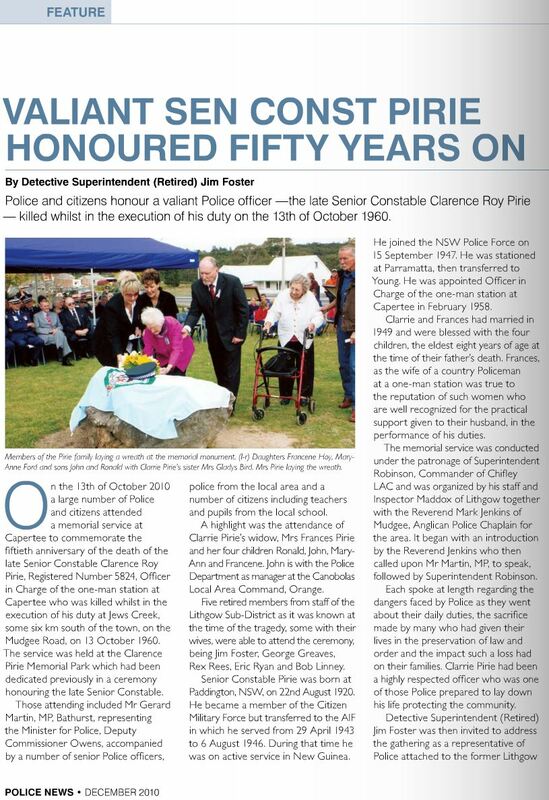 Senior Constable Clarence (Clarie) Roy Pirie was born in Paddington, Sydney, in 1920. During World War 2 he joined the army and served in New Guinea. 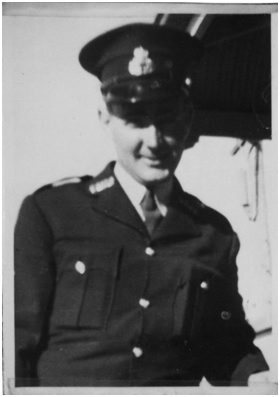 After the war, in 1947, he joined the New South Wales Police Force, and from 1959 to 1960 he was the Officer-in-Charge at Capertee Police Station. On the 13th October 1960 he was asked to look out for two male offenders who had abandoned a stolen car north of Capertee.While patrolling the area the following day, Pirie found two 14 year-olds with a vehicle at a roadside camping site at Jews Creeks south of Capertee. According to police records, these were not the suspects who had abandoned the vehicle the previous day but two escapees from the Yasmar juvenile detention centre in Haberfield, Sydney. While interviewing the youths one of them suddenly produced a stolen .22 rifle and shot the officer twice. The Senior Constable died of his wounds at the scene a short time after. The two youths were arrested the following day and were later imprisoned. Pirie was survived by his wife Frances and four young children. The memory of Clarie Pirie as well as the many other police who have been killed in the line of duty is commemorated each year on Police Memorial Day which is held near the end of September. SYDNEY, Thursday: – Police were to-night conducting one of the largest manhunts ever in the Central Western district for two youths who are alleged to have shot dead Senior Constable Clarence Roy Pirie, 40, of Cullen Bullen. The constable was chasing two youths on the Capertee Cullen Bullen Road early to- night. Pirie, a father of four, was believed to have been killed with a .22 rifle. Police from Lithgow, Bathurst, Mount Victoria, Kandos, Rylstone, Katoomba, Oberon, Orange and other centres are searching dense bush near Jews Creek. Police from other Central Western stations and from Sydney will join the searchers to-morrow. The searchers are heavily armed with rifles and riot guns. Other specialised weapons will arrive from Sydney to-morrow. At 9 a.m. to-day a stolen car was found abandoned at Cudgegong. Two youths were seen to leave the car and police in the area were alerted. Constable Pirie sighted two youths in a second stolen car on the Lithgow-Mudgee Road near Jew’s Creek. The stolen car overturned at high speed about a half mile farther on. Two youths scrambled from the wreck and fled into the bush. Police believe that the elder youth, realising that Pirie was following them, turned and fired the shot which fatally wounded the policeman. LITHGOW, Tuesday:- A 14-year-old Sydney boy was remanded in Lithgow Children’s Court to-day on a charge of murdering a policeman. He was remanded till November 1 without bail and will be detained in custody until that date. The boy was charged with having murdered Constable Clarence Roy Pirie at Jews Creek camping reserve on October 13. Police prosecutor Sergeant J. S. Smith said the youth charged with murder had escaped from a Sydney boys’ home on October 12 and together with another boy had stolen a car. The car was allegedly parked at Jews Creek’ Camping reserve the next day. When Const. Pirie approached the vehicle he was allegedly shot dead. SYDNEY, Monday: — Christopher Lindsay, 15, went to gaol to-day for 15 years for killing a policeman last year. Lindsay, of Alice Street, Newtown, did not appear to be emotionally upset at the sentence. He turned to court officials who led him from the dock to the cells below. The sight of the boy being led away brought an outburst of sobbing from the public gallery. Lindsay last week had pleaded not guilty to having murdered Constable Clarence Roy Pirie, 39, at Jews Creek Camping Reserve off the Mudgee Road near Cullen Bullen on October 13 last. The Crown accepted Lindsay’s plea of guilty of man slaughter. Lindsay – standing in the dock of Central Criminal Court with hands clasped in front of him – heard Mr. Justice Else Mitchell say that the deposition and Lindsay’s own signed statement left slender ground for the lesser offence. “Before committing this crime, you had shown a refusal both in England and in this country to conform with the laws which are made for the good of society. “From the record, it is clear that the processes of the habitation and reform which are provided by the country here have made no impact on your attitude or conduct. “In pursuit of this anti-social conduct you twice escaped from Yasma shelter, where you were being detained awaiting trial for various charges, and on the second occasion in company with a confederate, younger than yourself, stole a rifle, food, other goods and then a motor car in which you travelled to the scene of the crime. “Your subsequent conduct and your attempt to evade capture though perhaps natural do not appear to have been accompanied by any manifestation of c0ntrition or remorse, a fact which seems to me all the more serious in view of Dr. McGeorge’s conclusion that you are not suffering from any mental or psychiatric disorders. SYDNEY, Friday:— The Full Supreme Court to-day dismissed a school boy’s appeal against a 15-year sentence for the manslaughter of a policeman. The boy, Christopher Lindsay, 15, appealed against the severity of the sentence. Clarence Roy Pirie, at Jew’s Creek, last October. Pirie was questioning Lindsay on a car theft at the time. Lindsay to-day conducted his own case before the Full Bench — comprising the Chief Justice, Mr. Justice Evatt, Mr. justice Herron and Mr. Justice Hardie. The statement read: “I respectfully submit that His Honour, at the time of imposing the severe sentence for manslaughter, regarded the offence as tantamount to murder. “I further most respectfully submit the crime was not premeditated. “The whole tragedy took place in a matter of seconds. “At no time did I intend this man’s death. Mr. Justice Else-Mitchell, reported to the Full Court, that Lindsay’s offence was hardly distinguishable from murder. However, he had felt that he was bound by the Crown’s acceptance of the manslaughter plea. Lindsay originally had been charged with murder. Mr. Justice Else-Mitchell said it had been submitted he should not impose a crushing sentence. He also was mindful of the danger with a youthful offender — that the imposition of a heavy gaol sentence often could produce more harm than good. The Full Court ruled unanimously against Lindsay’s appeal. It added that Lindsay’s crime called for the greatest condemnation. A brother and sister came to yesterday’s National Police Remembrance Day ceremony to remember their dad who was killed in the line of duty 50 years ago. 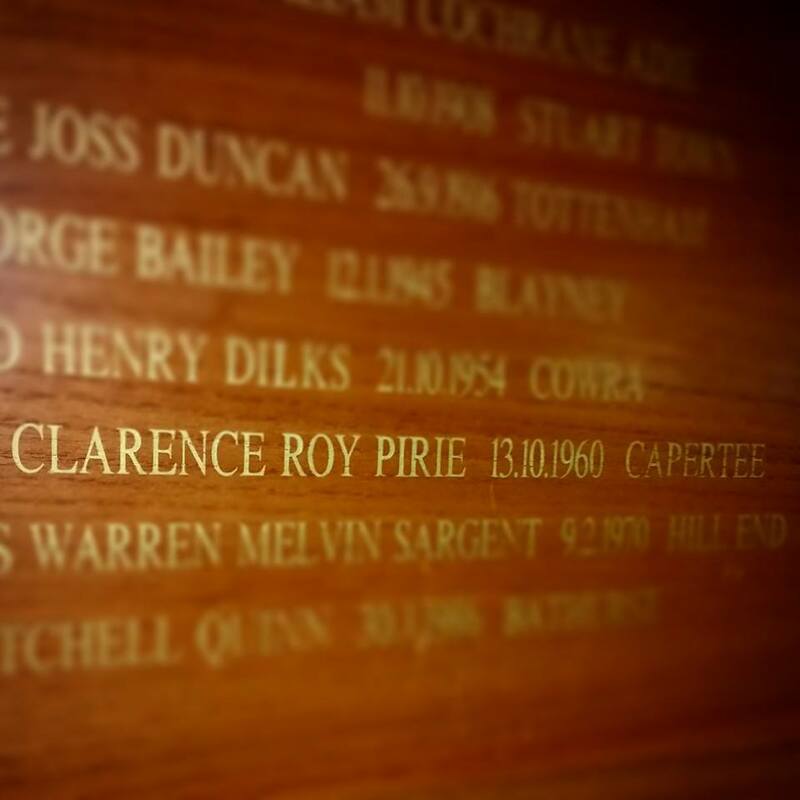 Three generations of Clarence Roy Pirie’s family came together in All Saints’ Cathedral to honour the police officer who was shot and killed by two escapees at Capertee on October 13, 1960. At the time her father was killed MaryAnne Ford was just three years old – her brother Ron Pirie was seven. There were two more siblings Francine who was not yet two and John who was five. After the police officer’s death, their mum was left to raise the young family alone. Although MaryAnne remembers little of her dad she still treasures the plastic ‘policeman plod’ doll that he gave her before he died. It is something concrete to remember him by. “The day I got married I left my bouquet on his grave,” she said. Ron said although he has blocked out a lot of his memories of that sad time there are things that he does remember – like being put in the wooden slab lock up when he was naughty. Although yesterday’s national remembrance day was to remember all police who lost their lives, for Clarence Pirie’s family it was very personal. Apart from MaryAnne and Ron, Clarence’s granddaughters Ruth Ford and Kellyanne Howarth were at the special ceremony along with his three-month-old great grandson Jaydon. They said the ceremony was both moving and beautiful. “It was hard, but it was good,” Ron said with tears in his eyes. ( 2014 ) The offender, Christopher Lindsay ( assuming he served the full 15 years, would have been 30 years of age when released from gaol in 1975. Assuming he is still alive today, he would now be around 69 years old. I did a cursory search for him, via Google, but it is a common name and persued it no further. 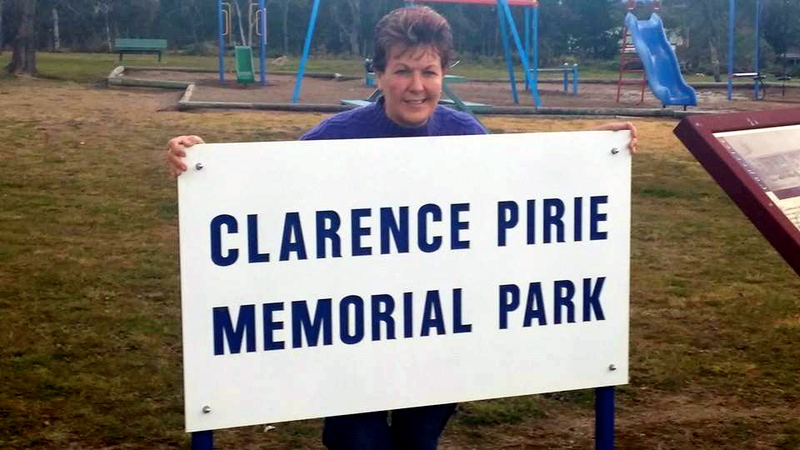 Clarence Roy PIRIE’s Daughter, Maryanne – July 2014 in the park dedicated to her father killed 54 years earlier. 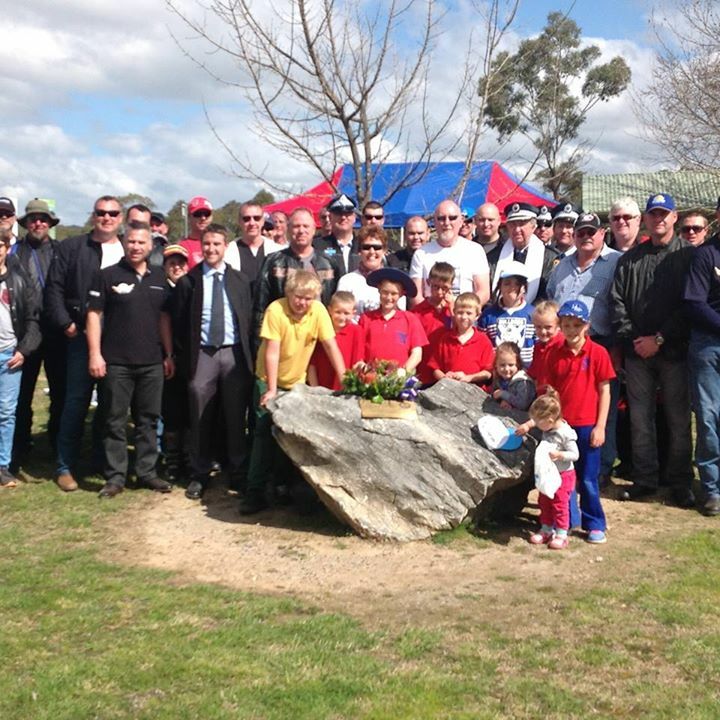 I was immensely proud, felt hugely honoured and felt very humbled that the Wall to Wall riders from the Western Region led by Geoff McKecknie stopped at Capertee today. I would also like to express my gratitude to Paul Bousfield and the Capertee Community, especially the school children and those that help with providing lunch for the riders.